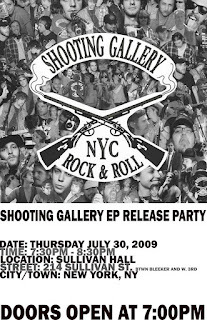 Some friends of mine started a band called Shooting Gallery, and are starting to develop a following in New York. They recently began recording their debut self titled EP in upstate New York at the venerable Marcata Studio and the tracks will be fully mixed by next week. I hope to put some of those up soon. If you are in NYC on July 30th, dont forget to come to the show at the Sullivan Room. There will be free copies of the EP and as always an excellent live performance from the band.